Welcome to the Venus Factor Fat Loss System: a truly mind blowing fat loss resource for women who want to live the fat loss lifestyle without fuss. I'm John Barban, and with help and input from key members of the Venus community, I have put together this incredible fat loss blueprint so you can cut through the misleading, time consuming and plain wrong information. Let's be clear about this. You don't have time to give different diets and fat loss systems a try. Who does? You have a busy life, work, family and social commitments. Time is ticking on and you just want to bring your daily life in line with the vision you have in your mind. I get it, I really do. What most fitness systems don't want you to know is this simple truth: fat loss can be simple. It does not have to take hours of planning, preparation and special mystery protocols. Female fat loss is not easy, but it is simple, once you understand the absolute truths of biology, hormones, physiology and psychology. The fact is, you are programmed to know most of this stuff already. Your mind and body want to know it, because it's all hard wired into you. You just need it all set out in one place so you can reconnect your brain and body, get into the correct mindset, and get going once and for all on the fat loss practices which work for women. So, here it is. 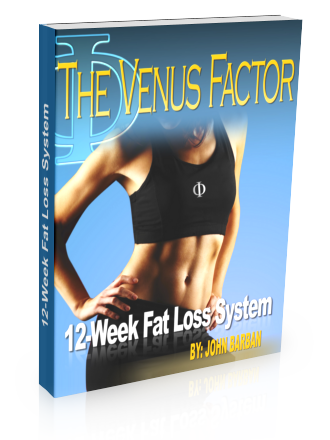 The Venus Factor Fat Loss System. At its core is a full 12-week nutrition program using the protocols which will work best for you. But it's so much more than that. What should you eat to lose fat and build lean tissue? Deficit and maintenance: what does these terms mean for you? You'll also get exclusive access to our online Venus Factor Virtual Nutritionist, a great piece of software which will help you discover your very own Venus shape (including those all-important measurements), target weight zone and calorie guidelines. If you've been on the Venus community forums, you'll have seen how most Venus women have their goal measurements in their forum signature. This is where you'll get yours! Speaking of the Venus community, here's where you'll get properly introduced to your new Venus family, the forums and the incredible support which you can lean on 24/7 whenever you need to ask a question, celebrate a success or get a little pick-up from someone who's been there too. You're going to be amazed by some of the stuff we uncover here. We'll help you dig deep to discover what your hot button foods are (and you can live alongside them) You'll learn how to manipulate the science of eat-up days and cheat days to bust through weight loss plateaus. And we'll help you stop thinking about good vs bad foods once and for all. You know what drives me nuts about the fitness industry? It's full of promises about how it will get you lean, how it will help you drop pounds and inches, maybe even get you ready for a show or photo shoot. Great! But what about afterwards? So many fitness gurus, systems and books just leave you there. How are you supposed to know about maintenance, about living a true, happy fat free lifestyle? Who supports you through the reverse dieting or transition periods? It makes me so sad to see women left floundering, often putting back most or all of the weight they worked so hard to lose. That will not happen to you now you are part of the Venus family. I made sure that the Venus Index Fat Loss System pays as much attention to the destination as it does to the process. We talk just as much about mindset, psychology and headspace as we do about workouts and meals. You will have our support today, tomorrow and long after you reach your goal. Because we know that fat loss and maintenance is not just a few months of the year. It's every day. And that's why I'm so glad you are about to access this Fat Loss System, because it's the one resource which will show you how you can live the fat loss lifestyle every single day and enjoy it too! …and join me and the many women who contributed to the VI Fat Loss System. That's enough from me for now. Click on the button below to download your very own copy of the Venus Index Fat Loss System: it's your blueprint for life. You will not regret it! Get started today. PS: Don't forget to visit the Virtual Nutritionist to see your very own Venus Factor numbers and start visualizing your incredible new physique! Hey, we'll talk about the power of visualization in the Fat Loss System, too! It's powerful stuff.